Soccer season is over for Estill County’s girls, but what a season it was. After going winless in Coach Danny Hwang’s first campaign, the team posted a 6-11-3 record, and gave Berea’s Pirates all they could handle in the first round of district action on Monday night. Leading only 1-0 at halftime, the Pirates went on to tally three more goals in the second half. 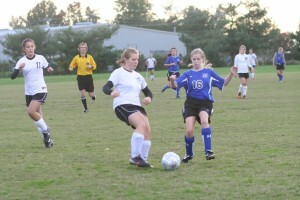 “In the first half, the girls did well holding the ball and keeping possession on the attacking half. “They are getting better in terms of passing and keeping the formation shape, which facilitates the possession process,” said Hwang. Noting the return of several key players, plus some younger players who have shown great promise, Hwang said he anticipates even more improvement next year. Estill closed out the regular season last week at Menifee County in a game that showed their improvement on defense. The two teams had played to a 2-2 tie to open the season, but this time around, the Engineers played them to a scoreless tie. Menifee had scored 27 goals during a season that saw them suffer only two losses. “It has been an honor working with such a talented group of individuals,” said Hwang.